A Colorado nature and wellness retreat. Colorado Springs—the state’s second largest city—is perfect for a sybaritic retreat. 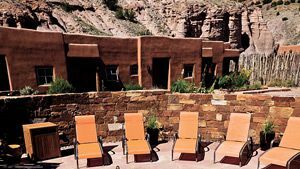 Home to a sumptuous resort and close to artsy Manitou Springs, which has long drawn travelers to its mineral waters, the conservative metropolis is one of the most well rounded in an area historically marked by mining and ranching. Weave hiking, spa treatments, shopping, and hearty fare, into one indulgent long weekend. About 20 minutes southwest of Colorado Springs, this 1,600-acre park provides a variety of outdoor activities amid a largely untamed wilderness. The wooded landscape is home to towering pine trees, patches of wildflowers, and a number of scenic waterfalls, including Helen Hunt Falls and Silver Cascade Falls. The park contains several picnic areas, as well as 15 miles of hiking trails and two visitors’ centers: the Helen Hunt Falls Visitor Center, which houses exhibits on history and local wildlife, and the larger Starsmore Discovery Center, which has free maps, nature exhibits, a bird-watching window, and a climbing wall. A registered National Natural Landmark, the Garden of the Gods is a collection of 300-foot sandstone rock formations set in the shadow of famous Pikes Peak. The formations are more than 300 million years old and have names like the Siamese Twins, Kissing Camels, and Cathedral Spires. Donated to the city of Colorado Springs in 1909, the 1,300-acre park has plenty of hiking trails and opportunities for horseback riding, mountain biking, and rock climbing. The visitors’ center houses exhibits on the history and geology of the park, as well as a café and a gift shop selling American Indian jewelry. This park near Colorado Springs allows visitors to go on adventures above or below ground. Guides lead tours into the Cave of the Winds, which is accessible with hand-held lanterns. A 3.1-mile hike descends into Williams Canyon, home of limestone walls and waterfalls. A more challenging course for harnessed “Wind Walkers” includes ropes, ladders, and steel beams. For kids, the park has less testing—but still exciting—activities like panning for gemstones and play areas that simulate cave crawls. There’s also a gift shop that has souvenirs like Zuni and Navajo turquoise jewelry and, of course, T-shirts.